A Sweet Briar student practices at Poplar Grove Golf Club. 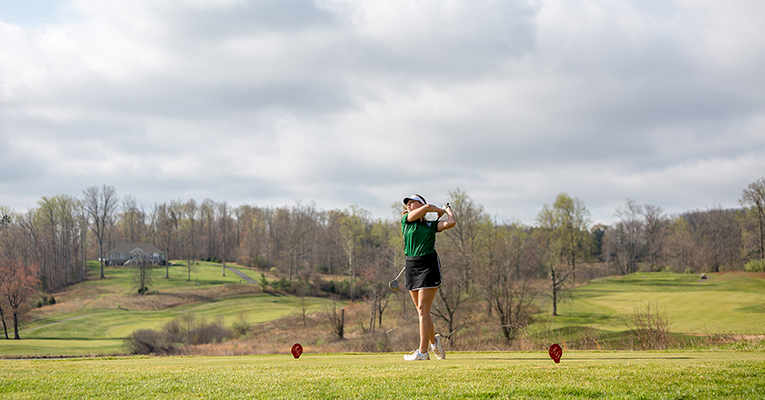 Sweet Briar College and Friends of Athletics will host their annual Sweet Briar Golf Classic on Saturday, April 13, 2019, at Poplar Grove Golf Club. The tournament will get underway at 8 a.m. with breakfast and the shotgun start will take place at 9 a.m. Following the tournament, participants are invited to a reception with appetizers, cocktails, music and a silent auction. The tournament champions will also be recognized at the reception. Individual golfers can participate for $125. A team of four can play for $450. Sweet Briar students can play for $65. There are a number of sponsorship opportunities as well, ranging from $2,500 for a platinum sponsorship to $250 to sponsor a hole on the course for the day. The tournament is open to community members, alumnae, fans, friends and family of the Vixens. For more information or to register, visit vixenathletics.com/golf.